Rewalsar lake is located in the district of Mandi, around 20 km from the town of Mandi. The place, boasts of a refreshing beauty with its emerald green lake and thick woods in the surroundings. Moreover, the place is sacred for three religious communities of India - Hindu, Sikh and Buddhists. For Buddhist, the place is significant because of its association with Guru Padmasambhava. He was a yogi or a sage from Uddiyan (Swat of Pakistan) in the 8th and 9th century and skilled in tantric powers. Legends goes that he wished to train the daughter of the local raja in meditation but the raja was so infuriated that he had Padmasambhava thrown into flames. However, powerful as he was, Padmasambhava presented himself as a lotus flower surrounded by water. This did the trick as the raja was now mighty impressed and even allowed his daughter to be his disciple. Later, Padmasambhava flew to Tibet on a tiger. There, he overpowered the local deities and converted them into the protector of Buddhism. Thereafter, he established Tibet's first monastery at Samye. The place from where he departed for Tibet in order to spread dharma (which came to be known as Lamaism) was off course Rewalsar. Hence, the place attained a status of almost a pilgrim destination. 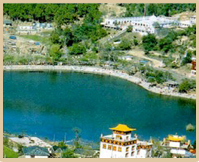 It is believed that in the caves around the lake, Padmasambhava left his footprints. Rewalsar is home to quiet a few monasteries that belong to Nyingmpa sect. Of special mention are Drikung Kagyud Gompa, Tso-Pema Ogyen Heru-kai Nyingmapa Gompa and the Zigar Gompa. The gompas, in red, yellow and white, have gold fringed pagodas. Other highlights of the monasteries include murals depicting a wonderful amalgamation of the Indo Chinese style and a huge stucco image of Guru Padmasambhava. The Tso-Pema Ogyen Heru-kai Nyingmapa Gompa has a museum with colourful murals. The islands that float in the lake are believed to be inhabited by the spirit of Padmasambhava. It is famously said that the floating islands of reeds can be set into motion by both prayer and breeze. The village of Rewalsar is extremely tranquil and a perfect place to arouse your spiritual self. There are less than hundred houses in this village, spreading around the lake, which have low slate roof. Basic accommodation and eating options are available at Rewalsar. There is HPTDC Rewalsar Inn and Peace Memorial at the Drikung Kagyud Gompa which you can choose for your stay. Alternatively, you can also decide to stay in Mandi. Air : The nearest airport lies at Bhuntar and is at a distance of 89-km. Taxis/buses are available from this place to transfer you to Rewalsar. Rail :The closest broad gauge railhead is at Pathankot, around 234-km away. Nearest narrow gauge railhead is at Jogindernagar which is 80-km from Rewalsar. By Road : Rewalsar is well connected by road from Mandi from where regular buses leave for this sacred place. Mandi in turn is also well connected by road to other parts of the state.